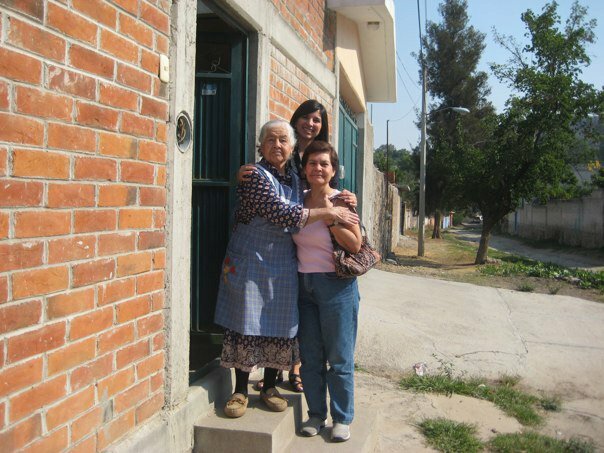 My grandmother, mother, and I outside my grandmother’s house in Jerecuaro, Mexico on Mother’s Day in 2011. This June we celebrate Immigrant Heritage Month, and the First Focus Center for the Children of Immigrants is honored to join once again in the celebration. I am also honored to once again be part of the Welcome.Us honorary board, and to share my own story. Like most Americans, my family’s immigrant story is one of dreams, hard work, and sacrifice. My mother was the first in our family to migrate to the United States from Mexico in 1968. She came to the U.S. as a nanny for a family who was relocating to Indianapolis, Indiana. When she arrived to the U.S., passing through Chicago, it was her first time being outside of Mexico and seeing snow. However, it was not the first time she had traveled in search of a better life. When she was just 13-years-old, she left her small town of Jerecuaro to work full-time as a housekeeper and nanny in the huge, noisy, and intimidating capital city of Mexico. She used her earnings to help support my grandmother, who had been widowed when my mother was just a year old. My grandmother had been forced to leave my mother and her older brother in the care of family members when they were just toddlers so that she could go work in the homes of wealthier families in the nearby cities in order to support them. The money my young mother sent home also went towards financing the education of her younger brothers and sisters because she was determined that her siblings would finish school rather than work—something she had so desperately wanted for herself and was determined to make possible for her own children one day. My mother struggled upon moving to the United States. Even as a documented immigrant, she was exploited just like so many other domestic workers. She worked around the clock as a live-in nanny, housekeeper, and cook while earning only $150 a month. Even then, she still sent most of her earnings back to Mexico to her mother and siblings. She ultimately decided to remain in this amazing country, and thanks to the kindness of others, she was able to slowly build a life for herself. An angel, who I came to know as my “Grandma Dottie,” took my mother in as her housekeeper, and not only paid her a fair wage and paid into her Social Security, she also helped my mom learn to drive and sent her to English classes. But most importantly, she made my mother a part of her family. When my mother later married my father in 1975 and brought him to Indiana, Grandma Dottie insisted they continue to live with her until they were able to purchase their own home. My big sister actually spent her first two years in Grandma Dottie’s house. Her husband, another angel known to me as “Papa Bus,” helped my father land his first full-time job. And when my sister and I were ready to go to school, Grandma Dottie helped my parents get scholarships for us at one of the best Catholic schools in town. Of course, it wasn’t easy growing up as one of very few immigrant families in central Indiana, and my family experienced a lot of discrimination. In school, I couldn’t figure out if I was black or white, and I was completely embarrassed of my parents’ accents and the food we ate at home. My sister and I even made a pact after we started school that we would stop speaking Spanish completely (a plan that ultimately failed thanks to my parents’ creative interventions). For a long time, I feared that my father being a resident “alien” actually meant we had come here from Mars. We struggled to fit in, and I remember just wishing we were “normal.” It broke my heart the most when I would see my parents humiliated by people who would give them a hard time for not speaking perfect English. Over the years, I eventually learned to not only appreciate my immigrant heritage, but to be fiercely proud of it. I also discovered that there are many angels like my Grandma Dottie all over the country, people who remember their own immigrant roots and believe in giving newcomers a helping hand. Being Mexican-American and a daughter of immigrants defines who I am, as a daughter, an aunt, a wife, a citizen, and an advocate. It’s one of the reasons I am passionate about the work I do, advocating for federal policies that promote the best interests of immigrant children and families. After obtaining my masters degree, I went to work organizing in my community, then working in philanthropy, and later at a community-based organization serving immigrants in my hometown of Indianapolis. When I saw so many of the youth and families we served held back by their lack of immigration status, I decided to move to DC to advocate for policy change. Children of immigrants now make up one fourth of the U.S. child population, and yet our policies continue to create barriers to their success. We need to ensure that our education policies address the needs of English Language Leaners, that early childhood programs are accessible to immigrant families, and that immigrant children are not barred from higher education due to their immigration status. We need to ensure that our safety net programs are inclusive of children in immigrant families, and that immigrant workers have access to the income supports designed to strengthen working families. We need the Administration’s new immigration executive actions, specifically the Deferred Action for Parents of Americans (DAPA) program and expanded Deferred Action for Childhood Arrivals (DACA) program, to move forward so that millions of mixed-status families can stop living in fear of deportation and so that parents can obtain work authorization and better provide for their children. We need to ensure that unaccompanied children entering our country are provided the protections they need and are connected to legal counsel, and we need to stop the inhumane and harmful practice of detaining vulnerable children and families in jail-like facilities as a means to deter future migration. And, ultimately, we need federal immigration reform that will provide a pathway to citizenship, and finally create an immigration system that works for children and families and strengthens our country as a whole. I will continue to fight for an America that honors our history as a nation of immigrants. I recently got married, and as destiny would have it, I married a Guatemalan, who is now a new immigrant to the United States. As he and I start to consider building our own family, I’m dreaming of a future filled with hope and opportunity for our children, much like the dreams of my mother and father when they decided to raise me and my sister here. I want our children to be proud of their immigrant heritage and to feel like they, too, are part of the great American dream. Want to learn more? First Focus is a bipartisan advocacy organization dedicated to making children and families the priority in federal policy and budget decisions. Read more about the First Focus Center for the Children of Immigrants. Want to get involved? You can support our work on child care by making a donation or joining our mailing list to receive updates and action alerts on this issue.